Made popular in the 1960s, when it was referred to as "double glazing", secondary glazing prepared the ground for all of the multi-glazed windows that have followed. The frame material and construction may have changed - UPVC, aluminium and engineered timber, as examples - but the starting point remains the same: two panes of glass are better than one. The Cambridge Secondary Glazing range delivers up to 65% improvement in insulation and up to 80% reduction in noise, on a typical installation. The design and manufacture of the frames can be matched to the primary window and be produced in any colour you specify. This combination of hi-specification and performance makes secondary glazing the perfect choice for all homeowners, whatever the age and style of their property. But for improving older properties, listed or in planning-sensitive areas, perhaps, it provides a solution that meets both the criteria of the planning office and the homeowner. The technical bit. Well sort of, it's tricky to make a second pane of glass too technical, but that's the point. Its simplicity is the key to its success! 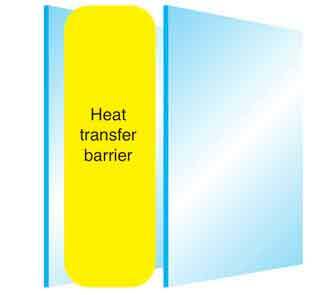 The 'Heat Transfer Barrier' that is created between the two glazing panels, produces an insulated layer that means your property is warmer during the winter and cooler in summer. All multi-glazed windows produced today rely on the same system; it is only single-glazed windows, often in older properties, that miss out. Simply installing a second glazed panel, typically 150mm from the primary window, dramatically improves both insulation and noise reduction. For the full range of benefits please read the information below. Insulation is the big one. We can make the case for noise reduction, increased security and minimising condensation, but the main reason people specify secondary glazing is to increase their insulation levels and reduce their fuel bills. With an improvement of up to 65% achievable, you can see why we have no hesitation in recommending secondary glazing. Every secondary glazing unit that we install has benefitted from many years development; each lock and seal working hard to retain valuable heat inside and resist the ravages of the weather outside. Considered by many to be the environmentally-friendly solution, our secondary glazing units represent an excellent investment with the benefits being felt from day one! Noise pollution is a problem that can affect people in all parts of the country. For many, it is the noise produced by a nearby road or aeroplanes flying overhead. It could be much closer to home: a noisy neighbour, perhaps, or local company working late into the night. The impact should not be under-estimated and a solution, if it is available, will make a huge difference to the quality of life of those affected. Our Paxtons Range, using 4mm toughened glass, can can make a big difference to the lives of people who are currently suffering. And, for those who are living with very high levels of noise pollution, our acoustic glass can reduce noise levels by up to 80%. It is this level of performance that leads many city-based hotels to install secondary glazing as standard in all rooms, they know how important a good night's sleep is to their customers! Naturally occuring, condensation can be a problem for properties of all sizes, types and ages. Installing our Cambridge Secondary Glazing units can provide a cost-effective, longterm solution. Following a full assessment of the problem, our consultants will design a secondary glazing scheme that works with your current window. For larger problems, the introduction of trickle vents can help manage the airflow around the existing window and the new secondary glazing panel, creating a balance ventilation system. In these conditions the condensation is virtually eliminated, along with the damage that unmanaged condensation can do to your existing windows. The high quality construction of our secondary glazing frames, and toughened glass used in their construction, provide a valuable second line of defence in the event of a break-in. Windows are often targeted by criminals who see them as the weakest point of a property's defences. Secondary glazing can help to address this problem by providing another noisy layer for the intruder to break through, providing valuable extra time for the property owner to call for assistance. As well as being a noisy physical barrier, the tough aluminium frames are securely installed to resist forcing, and are very difficult to penetrate from the outside. The high-quality materials and components used in the frame and surround are also difficult to saw or file, further frustrating any attempt to enter quietly. For properties that are particularly vulnerable, secondary glazing can be specified as part of an overall security solution.